So very very nearly done. Archie- Hi, been a while since I’ve been on here. Some may remember I was throwing all my toys out the pram in the last update and lost motivation for the bike. Got the motivation back and thus happened! Still not running right – needs the jetting sorting and a hi flow fuel tap on as you can crank it right open and she screams off, but then uses all the fuel before it’s got anymore. Low down cruising speed it’s stuttering quite a bit so needs bigger jets on for a smooth power delivery. Ride wise – it’s awesome! There were concerns that it would catch the frame on bends – sometimes it does, but the majority of riding it’s absoloutely fine. Vibrates through the bars pretty badly too – trying to write this with what feels like a case of white knuckle. but hopefully sorting the jetting out should cure that. Plan is to get it running right for the summer here in the UK, hit some more shows on it, then pull it apart and get it painted and the frame sorted. Quick plans will be relocating the fuel tap and sorting out the battery box with another mount as it’s swinging pretty freely. Pretty chuffed with it for now! Great job on finishing the bike. I love the old tank that you decided to use. The insect splatter was epic. don’t paint it – it looks fabulous as it is! hey man very very nice bike ,loved the vid. I’ve heard filling the handlebars with lead shot will help vibration. Lots has been tried, silicone etc (doesn’t work) and other stuff that seems to make sense, and lead shot works the best. I have 4″ ground clearance on mine. Can’t corner hard! Love it! Another thing that cuts down on vibrating bars is changing the sprockets to reduce engine RPM at cruising speeds. I had two of these bikes at the same time that were hardtailed and one was a dream to ride, the other made me feel like my hands were gonna fall off. The major difference between the two was the tooth count on the sprockets. I’d go with an 18/32 combo. The video makes me want to get out and ride! Nice bike by the way. Changing the sprockets to lower engine rpm at cruising speeds helps a lot too! Looks sick! Love the style. Forks look like those from a Warrior or R1. Nice! Hi guys, just seen this has been put up. Forks are ZXR400 items and i’m never sure on them. Sometimes look good and other times don’y quite suit it. Saga’s not over! Shortly after this it cut out on me making me push it a mile or so to a friends parents house. What had happened is that the battery managed to swing itself upside down and cut through the loom. bike is currently laid up as it needs a new battery/leccy box making. But I have welded in an airline fitting into the tank and got an inline fuel tap as well as re wrapping the pipes in black! Once I pull my finger out and stop effing about with the volksrod it should be on the road again. 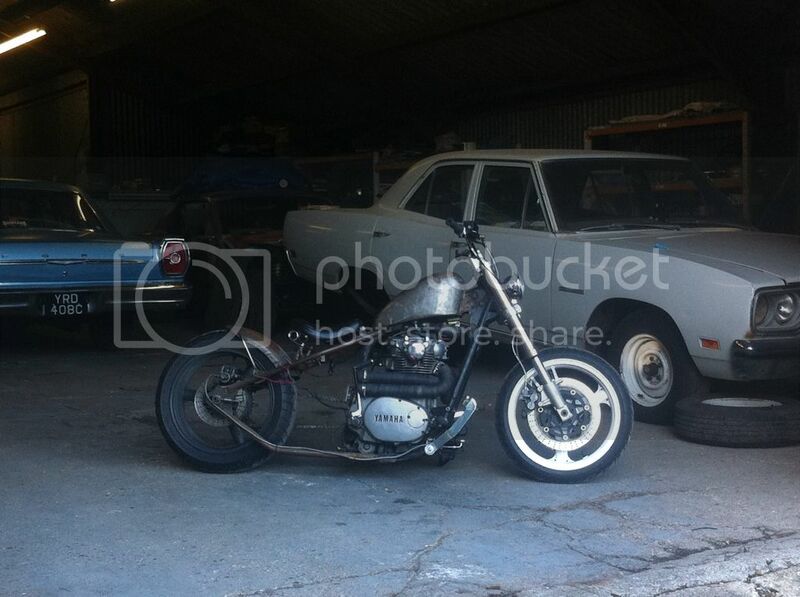 XS650 & Volksrod…..my other brother from another mother!